Greyhounds and lurchers are working dogs, but their working life can be hard and sadly very short. Lurchers are a cross between a greyhound and something else. They are used illegally for hare coursing and since the introduction of laws outlawing the ‘sport’, are frequently just abandoned. Because of this they are often found in very poor condition. 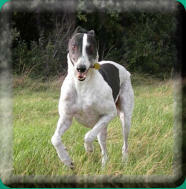 Greyhounds, on the other hand, live a perfectly legal life doing what they enjoy most ... running. They are arguably the oldest breed of domesticated dog (the only dog mentioned in the Bible), and have been used for hunting for thousands of years. 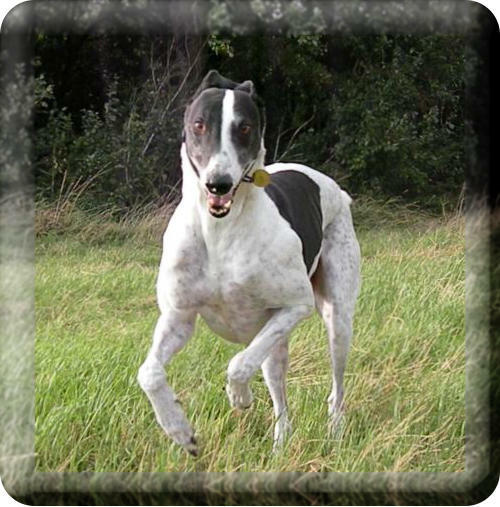 Greyhounds are sight hounds; dogs that hunt their prey by sight rather than scent; and are incredibly fast. At around 40-45 mph, and reaching top speed in seconds, they are the fastest breed of dog. Unfortunately, if they are not quite fast enough or get injured racing, their career is over and unless homed are likely to be put down. I have a greyhound, Sid (see picture to right) who, at just eleven months old was going to be put down because he wouldn’t race, though to see him run it’s hard to believe. Fortunately his trainer took him to a vet (many are just shot or worse) and the vet refused, saying there was nothing wrong with him and that he would not put down a perfectly healthy animal. We heard about Sid from a friend who owns greyhounds and knew we were looking for a companion for our other dog, Blue, took him home for a weekend in October 2004 to see if they got on, and he’s been with us ever since. Blue died in 2009 and Sid was heartbroken. We spent months looking for a new companion for him and eventually found Tilly. They are both now 11 years old and spend most of their time resting, but we love them as much as ever. You might think that being racing and hunting dogs, they would not make good pets. On the whole you would be wrong. Despite their size, greyhounds are very loving animals, particularly with children and older people. They seem to know instinctively that they shouldn’t be too boisterous with some people. Greyhounds are like the cheetahs of the dog world. They live in short bursts and spend hours just lazing about. Two twenty minute walks a day will provide all the exercise they need though if you have somewhere secure where they can run it’s unlikely that they’ll turn down the opportunity. Like all dogs they should be kept on a lead when being walked. They have no road sense and will happily chase after a squirrel or rabbit if they see one ... so be warned! Once they have seen prey don’t expect them to come back to you if you call ... their mind may well be elsewhere. Greyhounds and lurchers make great pets. For information on rescue charities, news, fun dog shows etc.